Absolutely! 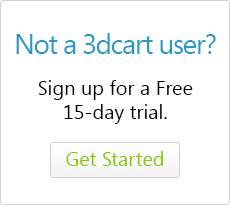 3dcart allows you to easily setup your online store by importing and exporting the bulk of your current store information. Such information includes customers, products, product options, and images. This guide will give you a step-by-step process on how to import your product bulk discount pricing information. Look towards the right hand side of the page and click on the +Icon next to "Bulk Pricing "
You may now add Pricing information to the proper columns. Do not remove, add, or edit any columns to this file.. If you do not have a need for a column please leave it blank. This is the exact format the file needs to be to import your Pricing information properly. For items with multiple ranges, populate the next row without the catalogid and product id. Then, add the lowbound and upbound and populate the rest of the columns accordingly to get all of your ranges added for the one product. The second product has only one range. After processing, your bulk prices will be imported to the store.